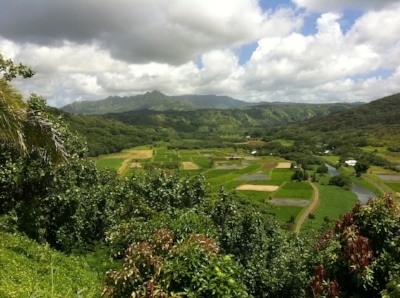 While destroying Hawaii's diverse food system, the growers created a prosperous agricultural trading economy with mainland markets as customers. But competition from low-cost producers elsewhere has more recently devastated that economy. The last remaining sugar plantation closed in 2016. The decline of the previously large sugar and pineapple industries now make Hawaii much more dependent on tourism as a source of income. Tourists are Hawaii's largest industry. They spent $15.6 billion in 2016 on vacations there representing about 18.5 percent of the total economy. That certainly underestimates their importance as many additional support services are needed to maintain the businesses that service the tourists. As tourism has grown, land used for agriculture has declined by 68 percent since 1980. Some of the former plantation operators have turned themselves into land development companies to take advantage of the tourism and real estate boom. Importing food is not a problem in and of itself. It turns out that some of the world's top food importing nations such as China, the United States and Germany are also top food exporters. They choose to specialize in what they grow most efficiently and export some of it, while importing foodstuffs which other countries are more efficient at growing by reason of climate, soil, water availability, labor costs and other factors. For countries such as China, the United States and Germany, disruptions in food imports might represent a mere inconvenience. Americans might feel deprived without bananas at their morning table, but they would have the option of choosing apples, pears or other fruit instead. But subsidies and other available measures—unless they are focused on building a diverse agriculture—might simply bring Hawaii back toward a plantation economy, not an economy that could actually feed the people of Hawaii. Here Hawaii faces two problems. A census done by Hawaii's still then independent government in 1850 put the population at around 84,000. The 2010 census showed a population of more than 1.3 million according to Hawaiian state census information. Using current agricultural lands, it would be difficult to feed a population that has grown more than 10 times (let alone the tourists who add another 220,000 people daily to the population)—even if crops were broadly diversified. In all likelihood much more land would have to be put under cultivation and many more people would have to be engaged in growing food in residential vegetable gardens, truck farms and large polyculturefarm operations. The second problem is that so long as the tourists keep coming, there is little impetus to reverse the trend in Hawaiian agriculture. The assumption is that the tourists will simply keep coming and coming forever. The September 11, 2001 terrorist attacks on the United States and the deep recession of 2008 and 2009 taught Hawaiians that there will be significant disruptions in tourist traffic, but that that traffic will always come back. Have they learned the right lesson? Other importers of food aren't so fortunate as Hawaii which even in the worst situation would receive aid from the U.S. federal government. Countries such as Afghanistan, Myanmar, Niger, and Yemen, in fact, 34 countries in all "are unable to produce their own food due to water and land limitations." For many in these countries getting their daily sustenance is a life and death struggle. The modern global economy has forced countries to specialize. This works well for those properly positioned with the appropriate infrastructure and skilled workforce. Without these many countries simply become sources of raw commodities for the factories and mills of advanced countries—and that's if those developing countries are lucky enough to have such an endowment. Specialization has its advantages. But it can also bring frightening vulnerabilities. A whole city of beautiful hotel rooms means little if few people come to stay in them. Hedging against such a day may just be too painful for Hawaiians to contemplate—which is the very reason they should start thinking about it right now.